The following information should help provide a general overview of Valentine’s metal stamping capabilities. It is important that part geometry, part size, material thickness and the ability to maintain specified tolerances be compatible with the production equipment and the expertise of your intended metal stamper. The following information is only a guideline to Valentine’s capabilities and we encourage customers to forward prints and specifications to help us assist you with the best solution for your precision metal component requirements. Valentine Tool & Stamping has a fully equipped pressworking department including over 30 power presses with press tonnage ratings from 30 to 116 tons. A majority of Valentine's presses are setup to run progressive tooling in automatic mode without press operator intervention for the most economical manufacture of high volume metal stampings. Additionally most of of Valentine's power presses are “straight side” or four posted presses, (compared to OBI or gap frame presses), which offer much more stability and rigidity of the press ram and tooling. This additional stability is better suited for maintaining tight dimensional tolerances due to the presses’ ability to minimize press deflection during higher tonnage operations like heaving coining, forming and blanking. The advantage of reduced press deflection plays a significant role in minimizing tool component wear due to tool deflection misalignment, thus reducing tool maintenance while improving quality and production efficiencies. Press Department with over 30 Power Presses, most of which are Straight Side Presses for precision stamping. 5 Bruderer High Speed Presses with top speeds of 800 to 1,200 strokes per minute. Redundant press capacity to eliminate the potential for production downtime. Product can be run as single units, left on the material strip in predetermined lengths with score marks for easy singulation, or in reel to reel continuous strip configurations as stamped or provided with value added full or selective plating. In-house design of all progressive & secondary tooling using 3D modeling software. Fully equipped tool room for in-house fabrication and maintenance of all customer tooling. 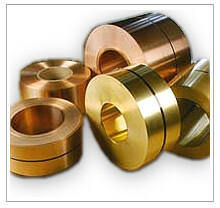 Approved material supplier network capable of meeting any raw material requirement. Fully equipped press department with the capacity for any customer volume requirements. Typical order quantities range from a few thousand parts to more than 50 million units per year. Qualified value added suppliers including: Anodizing, Plating, Heat Treating, Passivation, and Painting operations. 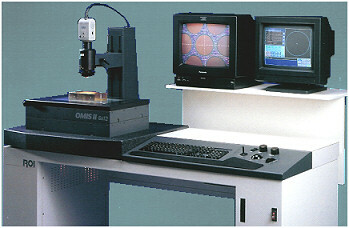 One of two state of the art optical coordinate measuring instruments with eBx software used to verify part geometry. As a result of 60+ years producing precision metal stampings, Valentine has had experience with most of the common metals that can be supplied as strip stock. Typical material thickness’ range from .001” to .190” . Formal print and specification review with the customer prior to the start of the tool design process. Exploration of opportunities for component feature improvements that may minimize tooling maintenance thus reducing unit cost. Generation of a component Quality Plan to itemize customer requirements, and to establish: essential resources, raw material specifications, process routing requirements, inspection control plans, and where required, value added operations specifications. 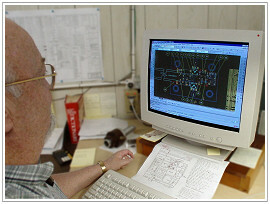 Valentine’s engineering department uses both Autodesk’s Autocad and Solidworks for our engineering design software. We encourage customers to submit component prints or solid models in a Solidworks format if at all possible. Solidworks is also compatible with most versions of Parametric Engineering’s Pro/Engineer software should that option be available. A significant factor in Valentine’s ability to provide world class metal stampings is as a result of our complete control over the in-house design and fabrication of all customer tooling. Having in-house tool build capability often puts Valentine at a competitive advantage over other stamping houses that rely on outside design and tool build firms where tooling lead times may be critical. Additional benefits are realized in the event that the customer has design upgrades that need to be implemented on existing production tooling. Changes can often be made much sooner than a competitor who may have to rely on a redesign by a third party tool design service. 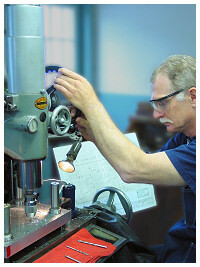 Valentine has a fully equipped tool room capable of supporting any customer tool build requirement. 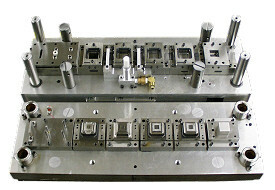 Key equipment includes milling, grinding, jig boring, jig grinding, sinker EDM, and wire EDM machinery. More importantly, Valentine’s staff of skilled craftsman are well trained in progressive tool build and maintenance procedures and possess the analytical skills necessary to support the complex tooling needed to produce components to the level of quality demanded by our customers.